My Happy New Year Bloody Martini - What's in your glass? Yes! 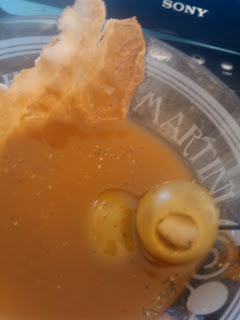 That IS bacon as a garnish in my 2013 Bloody Martini - along with a whole cocktail pick full of garlic stuffed green olives!!! You can't start a New Year without some Bloodies, some Pig & a nice nibble of flavorful olives can you??? May 2013 bring you all that you wish and more!